The holiday season is quickly approaching, which means gifts! 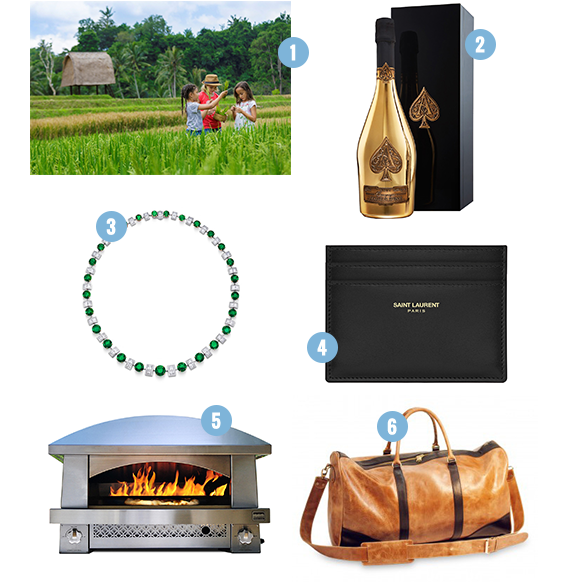 The annual LuxeTrends gift guide highlights creative ideas that are perfect for those who have everything and who appreciate the extra-special. From a bottle of personalized bubbly champagne to adventure travel that caters to kiddos, to an artisan fire pizza oven for entertaining, there is something for everyone. A Day of Eco-Discovery & Culture is an exciting adventure for all those mini explorers in your life. Hosted at the Mandapa Ritz-Carlton Reserve in Bali, Indonesia, lucky little ones can play sports or participate in a yoga class, taste tropical fruits and partake in a night safari, or even explore the nocturnal animals in their nature habitats. Champagne Armand de Brignac is offering a new gift personalization program for the 2016 holiday season. For the very first time, gift-givers can add a personalized message to a gold or rose-colored plaque which is affixed to the inside of the exquisite black velvet lined gift box. The effect is a precious and personalized gift for the most discerning luxury goods lover. Asprey, a top London based designer jewelry brand, has created a beautiful Emerald and Diamond Eternity Necklace that will truly make the love in your life feel like a princess. Round-cut emeralds and princess-cut diamonds are set in platinum and 18ct yellow gold and shimmer from every angle. This necklace will undoubtedly make her a show-stopper this season. The Saint Laurent Card Case is a slim wallet made of black leather and is ideal for men who like a classic look. The embossed Saint Laurent signature provides designer appeal and brings the quality and elegance of Saint Laurent to an unexpected place. Imagine cooking the perfect Neapolitan-style pizza at your home with the Artisan Fire Pizza Oven. Ready to cook in as little as 20 minutes, this sleek and sophisticated outdoor gas pizza oven bakes the perfect pizza for even the most discriminating pizza-lover, and ensures you can entertain as elegantly outdoors as you do in. A gift that gives back is even more fulfilling for the holidays. And now, many retailers are partnering to help make giving back easier. Consider the hand-crafted Weekender Duffle Bagby Sseko Designs. Sseko uses fashion to provide employment and scholarship opportunities to women in Uganda including covering university expenses for women. Made from Ethiopian oil-tanned leather this elegant and timeless design is reminiscent of eras past. Spread the holiday cheer and check everyone off your list with this thoughtful gift guide. And now, with holiday research and shopping behind you, relax and enjoy some time with the people who matter most.